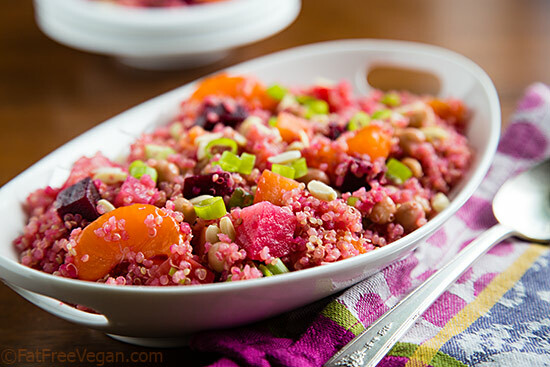 Orange slices and a maple-balsamic reduction add sweetness to this vegan beet and quinoa salad. I’m not sure when beet season is, but recently I was able to find three different types of beets in the local grocery stores: “regular” red beets, golden beets, and lovely chioggia beets. Faced with such a surplus of riches, I did what any beet lover would do–I bought them all. Then I brought them home and roasted them. If you don’t like beets, try roasting them. Roasting brings out their sweetness and minimizes their “earthy” flavor. Combining them with something sweet, like oranges slices, and something tangy, like vinegar, also enhances beets’ flavor. Roasted beets are a great addition to any salad–just slice or chop them and add them to any green salad. But I had a craving for quinoa, and I could just imagine the slightly grassy flavor of the quinoa and the sweet earthiness of the beets. To accentuate the sweetness, I added slices of clementines; to add protein and make this a main dish salad, I included my favorite legumes, chickpeas. And I tossed it all with the simplest of dressings, a reduction made from white balsamic vinegar and and a touch of maple syrup. I’m usually someone who loves strong, spicy flavors, so I didn’t expect to be wowed by this simple combination, but I could not get enough of it. I even made a second batch that I’ve been eating for breakfast. If you love beets, this is a “must try” and if you don’t like beets, how about giving them another chance? I find it easiest to make the separate parts of this salad–beets, quinoa, and dressing–at different times and then put them together later. I bake a bunch of beets at once so that I will have them for other uses, and I cook a double batch of quinoa when I need it for something else. That makes this dish seem less complicated to make. 1/4 cup slivered almonds Optional, but good. Preheat oven to 400 F. (I use my toaster oven to save energy.) Wash each beet well and wrap it in aluminum foil. (You can wrap it first in parchment paper and then foil if you don’t want it coming into contact with the aluminum.) Bake for 50-60 minutes, until you can pierce a beet with a fork. Set aside to cool. 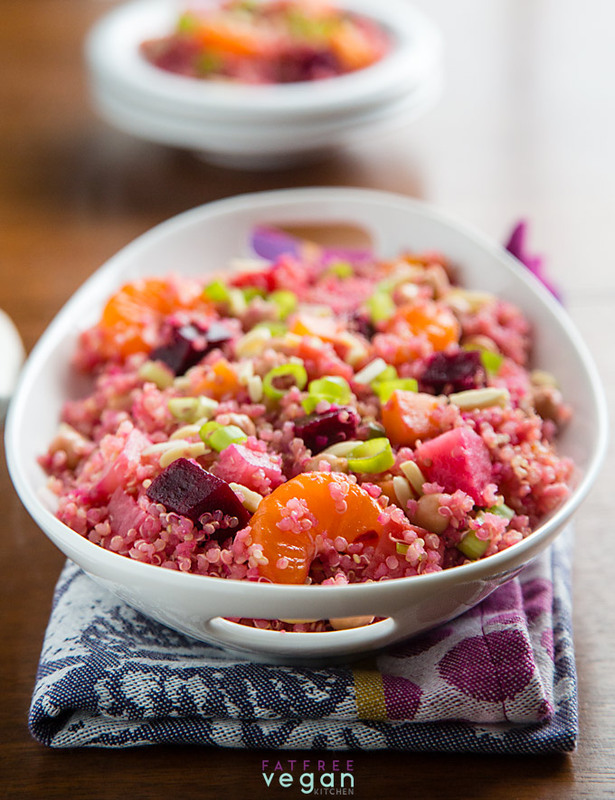 While the beets are cooking, cook the quinoa. Rinse the quinoa in a fine mesh strainer and drain well. Heat a medium-size saucepan, add the quinoa, and toast it for a few minutes until much of the liquid is evaporated. Add the vegetable broth and garlic, bring to a boil, reduce heat to low and cover. Cook for 15 minutes. Remove from heat and let stand until all liquid is absorbed. Fluff and let cool. When the beets are cool enough to handle, trim off the top and remove the skin by holding a beet under running water and rubbing the skin with your thumbs. Use a knife to peel off any stubborn patches. Dice the beets. Add them and the chickpeas, clementines, green onions, and almonds to the quinoa. Make the balsamic reduction: Put the balsamic and maple syrup in a small saucepan and heat it over medium heat, stirring constantly, until it boils. Continue stirring until the volume reduces by about a third–it should take about 5 minutes. Remove from heat and let cool. If it’s too thick to pour once cool, return it to the heat and stir in more balsamic vinegar until it’s pourable. Pour it over the salad and stir well. Refrigerate the salad until ready to serve. You can buy already prepared balsamic reduction if you want to save time, but it will probably be made with sugar instead of maple syrup (and more of it). Here’s one that claims not to have added sugar. Nutrition data includes almonds, which add 2.28g of fat and 26 calories per serving. Amount of sodium and some other nutrients depend on type of broth used. This post contains Amazon affiliate links to products I use. When you buy something through them, I receive a small commission that helps support this site at no cost to you. Thanks for your purchase! Oh my gosh, this is just so beautiful! Perfect harmony of fruits and vegetables together. Thanks for sharing! I think I will try this with grilled beets to keep my kitchen from getting too hot. From a devoted beet lover, I will definitely be making this. Fantastic photo!! This looks amazing! So bright and colourful, I wouldn’t be disappointed to be served this at a restaurant. OMG this looks amazing! I can’t wait to try it. I’m a beet lover anyway and I’m always looking for good cooked recipes that taste good cold. I take my lunch with me and in the summer I like eating cooler foods but want more than just “raw”. If I had beets now, I would make it today! Dont forget the chickpeas! They arent in the instructions even though they are in the ingredients list and the whole story before that. And, of course, i see them in the photos. OK, I’ve made this twice now and it’s definitely a hit. I love this as a hearty but refreshing summer salad. I had to substitute navel oranges instead of the clementines, but it’s still to die for. Wow, the colors are AMAZING. Beets are such a cleansing food, great for detoxing. I also use them as color ( instead of the artificial kind) in many things. Can’t wait for beets from my CSA now!!! This looks beautiful and sounds great! Chioggias are my favorite beets and the balsamic reduction sounds really good too. Wonderful photo! Hi Susan! 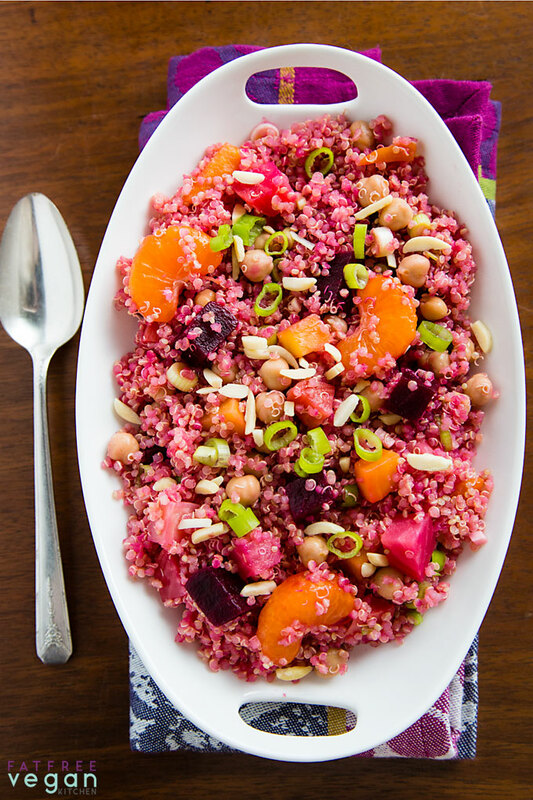 This looks amazing, I’m a beet and chickpea lover! Thank you for your blog and your colourful suggestions! I am neither a vegan nor vegetarian! I simply don’t like red meat, I am also on the” 5-2 diet ” so your blog helps me a lot! I love making them! what a stunning dish! looks lovely and super delicious! While making this was a bit of a production, it was well worth it. I did not have green onions (nor do I like raw onions), so I substituted chives. Other than that, I followed Susan’s directions and was not disappointed. I have never cooked beets before and managed to find fresh mandarin oranges, which were both delicious. Wow! This was easy and great. Love the sweetness of the dressing. Only thing I changed was I used ‘love beets’ infused with ginger. I made this dish this weekend and man, was it a crowd pleaser! Not only is it delicious I got a crowd of “oohhhs and ahhhs” in the office lunchroom! Oh, also, I froze the leftovers, and it heats up very well. Susan, I rarely leave comments, but I can’t contain myself! This salad is incredible! I cut the recipe in half because I’m the only one eating it…now I wish I had made the whole recipe….I could eat it all week! Looks delicious!! I absolutely love beets and adding citrus just gives it that extra zing! The beets give the salad such a beautiful color. I love strong, spicy flavors too, but sometimes simple combinations can really knock my socks off too. Those are the ones that are always such a beautiful surprise! Tasty salad that a group of friends enjoyed. I did add more maple syrup to the reduction for more flavor. The only thing I found is that all ingredients turned red so it’s not as pretty as the picture. I’m glad your friends enjoyed it. The secret to not having it all turn red is to use red beets for only part of the beets. I used 1/3 golden beets and 1/3 chioggia (pink) beets, so the color wasn’t so intense. Beautiful dish … I want to do 😀 Congratulations. Fantastic recipe!! It took me a long time to prep and make this dish, but it was well worth it. I used golden beets, so the salad has a beautiful yellow-orange color to it. I am eating it now- warm because I couldn’t wait for it to chill! Thank you, Susan for another delicious recipe! Susan! 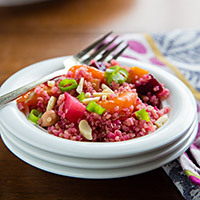 I started making this salad a few days ago – roasted the beets and cooked the quinoa and made the dressing and decided – today is the day to put it together. And what a beautiful, tasty recipe this turned out to be! I just love the flavors and even though it is winter and very cold in New Zealand at the moment, I can’t stop eating this lovely this salad! Just stumbled on this recipe on pinterest. Really looking forward to trying it! 🙂 Thank you. Made this today! I thought it was DELICIOUS!!! Since it was soooo good, I am going to check out your Thanksgiving recipes now! Thanks, Susan! I just made this with golden beets and substituted French lentils for the chickpeas. It is sooooo good. Thank you for the fantastic recipe!!! This one’s a keeper! Hi Susan. Do you think rice vinegar (unseasoned) or regular balsamic vinegar would be a good substitution? Brilliant idea! I’ll definitely use both and will let you know the result. The ingredients are already on my grocery list…I can’t wait to make this. Thank you Susan! I mixed both vinegars and it turned out just fine. Delicious dish! I can’t wait to try this, Susan! Thank you ! This is delicious thank you for this great recipe. The amount of servings, 8 servings is not really realistic but then I used it as a main course..